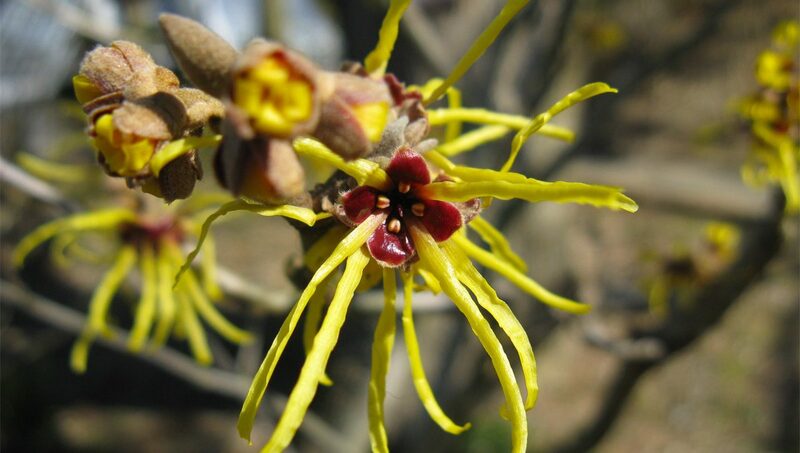 The awakening of the Hamamelis bloom is one of nature’s welcome signs that spring is not too far in the future. This small tree, or stout shrub is an anomaly among all the flowering trees in that its spectacular beauty comes mid winter. 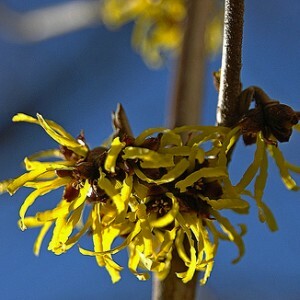 Most varieties (excluding Hamamelis virginiana that blooms late autumn) will send out brilliant star-like blooms at a time of year that is often void of stunning or showy growth. This spark of the Hamamelis bloom is a made up of delicate petals like tiny streamers. Each threaded blossoms also produce a distinctive fragrance that will inspire anyone anticipate to the birth of spring. There are a number varieties that are available in the trade, each ranging in color, scent and bloom time. Common witch hazel, Hamamelis virginiana; Chinese witch hazel, Hamamelis mollis; Japanese witch hazel, Hamamelis japonica and many selections of the hybrid between Hamamelis mollis and Hamamelis japonica, Hamamelis x intermedia. I favor the hybrids because of their distinctive color, fragrance and mid winter bloom time. My favorite is H. x intermedia ‘Feurzauber’. It is one of the best red flowering clones. Second is the coppery-orange flowering ‘Jelena’ and ‘Strawberries and Cream” both being a beautiful concoction of red, pink and yellow. H. mollis ‘Wisley Supreme’ and ‘ Early Bright’ hold some leaves throughout the winter but have fantastic fragrance. This star studded winter-flowering tree is a perfect addition to any landscape or woodland garden. They make a great boarder or grouped in mass (take a look at ones planted by the airport authority and Logan International, terminal B?) Grouped together makes a stunning spectacle. Hamamelis makes an attractive specimen tree with decent foliage for summer and fall color. The flowering branches in winter also make a wonderful addition to any indoor floral arrangement.